If you are looking for a specific stone, and don't see it, please ask! Alexandrite from Brazil: one of the rarest of gems, the color change from a bright light green to pastel violet/blue. For those that have always wanted to collect or facet some genuine Alexandrite, this is your chance! Though this material does not have the complete red to green color change of the finest gem grade Alexandrite, it does come at a fraction of the cost. These eye-clean pieces range from .5 to .9 cts each. This is rich colored material that cuts a fine velvety purple stone with a distinct color shift from daylight to incandescent light. Clarity is excellent, though some pieces have the color banding typical of this material. This is one of the Feldspar group of gems, prized by collectors and excellent for pendants and earrings. This is select material from Mexico. Most Bytownite available to faceters is under 15 cts per piece, and this material is exceptionally large and clean! Hardness is 6 - 6.5, RI about 1.56, and it has a fine amber color. It does have prominent cleavage planes, but they seldom cause problems in faceting. As with all feldspars, it polishes readily with cerium. Pieces over 21 ct each: $0.30 per ct. This has a bright golden orange color with some color zoning, and there are few flaws in these fine, blocky pieces. These are an excellent size for all jewelry uses. It cuts easily, and polishes well with cerium. 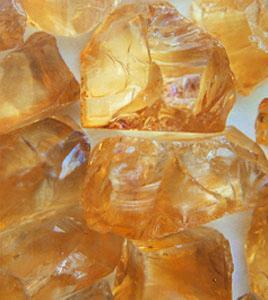 As with virtually all citrine on the market, consider this material as heat treated. 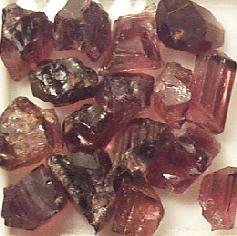 pieces up to 20 cts: $ 0.30/ct. Larger pieces, 20-25 cts each, $ 0.75/ct. 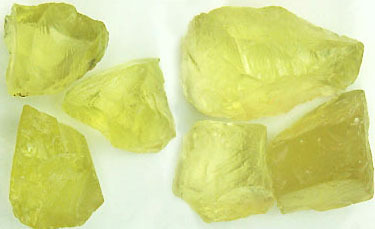 Lemon Citrine, a variety of the quartz family, has been treated to a yellow citrine color that has just a hint of green (like an almost ripe lemon). This is not to be confused with the "neon" green/gold quartz, which is green with a hint of yellow. Pieces range from 30 to 200 cts each. As with all quartz, prepolish with 1200, and polish with cerium. Madeira, Brazil: Jumbo-sized pieces of gorgeous deep orange material with a good orange/red flash. This material is getting harder to find, especially in larger sizes, and these pieces range from 15-20 cts each. This is very clean material and will cut some fantastic gems! As with all citrine on the market, consider it to be heat treated. The Birthstone for January, and attracting more attention now than ever as new finds of exotic varieties and colors gain popularity. Hardness: 7 to 7-1/4 RI= varies with composition, 1.73 to 1.89 We are proud to offer some that have just arrived from recent finds in Africa and Brazil: choice colors and varieties of clean faceting rough that will produce brilliant and exceptional gems for all jewelry uses. What distinguishes Rose Almandine from the average Almandine garnet is that it is not as dark and does not have the brown cast to it; it has pleasing orange/pink (rose) overtones, which makes it a very pleasing gem! 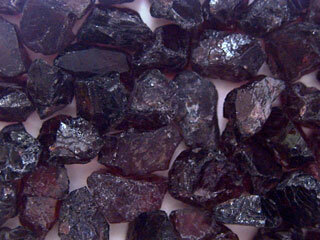 It is also the hardest and most durable of the garnet family, so it is excellent for all jewelry uses. We recommend cutting in a brilliant style (not deep cuts, like Barions) and using a prepolish with a 1200 NuBond lap or 3000 metal bond lap, followed by polishing with alumina on tin (or BATT). 7-12 ct. pieces $ 1.25/ct. 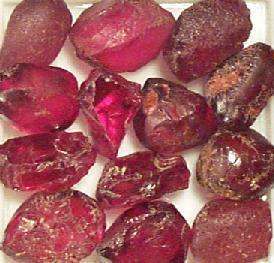 These are often called Arizona "Ant Hill Garnets", and they cut brilliant stones with an intense ruby red/violet color. These are small, ideal for earrings and small rings, or for use as accent stones. Most should yield stones in the 3 - 4 mm range. Some might like them for practice at cutting small stones before they venture into cutting some of the more expensive materials. 2 to 3+ cts each. $ 2.50/ct. Smaller pieces that average 5 cts per piece are just $3.00 / ct. 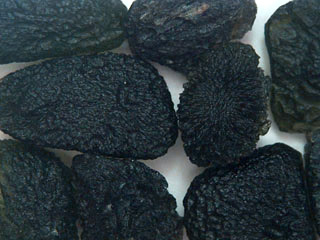 This is a variety of tektite found in the Czech Republic. Generally believed to be linked to celestial origin, it makes a unique and beautiful gemstone. Use angles as for obsidian; cerium usually provides an excellent polish. Pieces are a fine forest green, and are great specimens as well as fine faceting rough. Pieces from 10 to 25 cts each; some have been trimmed for better faceting proportions. 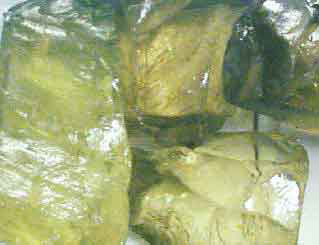 Clean crystal sections of quartz crystals that have been treated to a stable, permanent shade of "Neon" green. Pieces range from 200 to several hundred carats each, and yield unique and beautiful gems. Facet a real attention-getting stone without a large investment! This material has been one of our biggest selling items at gem shows- amazing color at an affordable price! Let us know your size preference, and we will hand select the rough to meet your needs! This material is clean and blocky for excellent yield. This is the fine colored material from Madagascar in blocky pieces from 10 to 70 cts each- the color saturation and clarity of these! There is no word for this material but INCREDIBLE! These are bright fancy colors: blue, grape, purple, raspberry, and even some pinks! These are from the Tunduru region of Tanzania, and may not be available for long... These pieces are from 1 to 2 cts each, have good clarity, and are not heat treated. This is a group of minerals: aluminum silicates. They are easy to work with, and make attractive gems. They have a hardness of 5 to 6, (about like apatite and opal) which makes them more suited to placement in earrings and pendants, but not out of the question for rings. Scapolite has a deeper color down the "C" axis, so you can orient them differently for a variety of effects- the deepest color will be with the table at 90 degrees to the "C" axis, and the brightest stone will have the table parallel to the "C" axis. 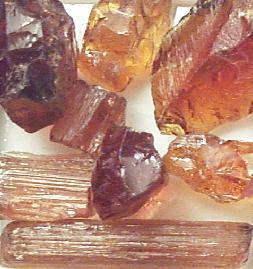 This is a mix of clean crystal sections and cobbed material from Espirito Santo, Brazil, treated to obtain a rich and unique orange-to-rootbeer color. Scapolite is easy to work with, and cuts colorful brilliant gems. These pieces are all eye-clean, facet quality, and have been hand-picked from a larger parcel for their fine color and shape. Pieces from 5 to 10+ cts: $2.00 / carat. We have been lucky enough to obtain a parcel of scapolite from Africa treated to obtain hues from a deep "raspberry" color (some of them are a fine purple/violet) to lilac shades, and even a few "orangy pink". These are pieces averaging about 3 cts, and ranging from 2 to 6 cts. They are well shaped for faceting, and are eye-clean with few flaws, if any. When ordering, include your preference of colors. 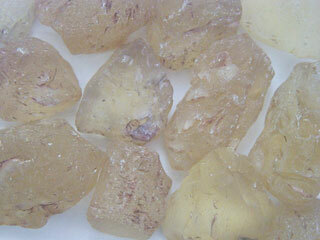 $1.25 / ct.
Oregon Sunstone faceting rough from the Dust Devil Mine! Some have the copper schiller that is common to sunstone, and we do have the more rare and highly prized material that has the color without the schiller; these typically are found as a clear to amber stone with a section of colored material in the center. Sometimes the red & green material exhibits a color change effect when faceted- these are perhaps the rarest of all, and you can only tell if you have one by checking it after it is cut. (Incandescent/fluorescent light is the strongest color change.) Oregon Sunstone is easy to cut, though it cuts slower in some directions. It has obvious cleavages, but these seldom present a problem in cutting or polishing. Prepolish with extra fine lap, then polish with cerium. Sun 1: pink w/schiller: 12 - 22 ct pieces. $ 6.00/ct. Sun 2: dark pink - medium red/orange; little schiller if any. 9 - 20 ct pieces. $ 8.00/ct. Sun 3: deeper red/orange to reds, some with green. 11-25 ct pieces. $ 10.00/ct. We have been able to obtain some really fine Imperial Topaz from Brazil. All pieces below are well shaped for faceting and are exceptionally clean. There is something for everyone in this assortment! This is the birthstone for November; with a hardness of 8 it makes an excellent stone for all jewelry uses. 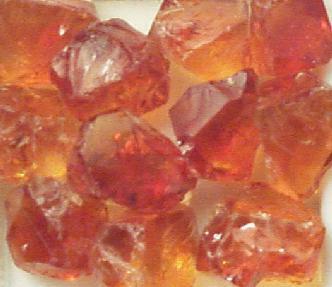 Topaz 2: Fine golden/orange pieces in medium shades; 4 - 8 cts. each. $ 12.00/ct. Topaz 3: Medium golden/orange with a more saturated color on the "C" axis. This material will cut some superb gems! Pieces are 4 - 9 cts. each. $ 18.00/ct. Topaz 5: This is as good as it gets- some of the finest ever available! This is a rich, deep-colored orange/pink with a highly saturated "C" axis- all well shaped for faceting clean stones that will be real "attention grabbers"! These are 4 - 7 cts. each. Buy some today at: $ 35.00/ct. These come in a wonderful array of colors, and we have placed quite an assortment of colors in these parcels. Tourmaline parcels will be made up of a mixture of colors and sizes ranging from 1 ct. - 5 cts. This is fine, untreated, clean crystal sections and pieces in vivid shades of red, with some rich pinks. This material is some of the finest colored tourmaline we have ever offered, and has been selling quickly. At this point, there is no new material coming into the market. 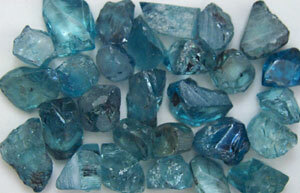 1.7 to 2.7 cts per piece: $ 10.00 / ct.
Fine blue zircon from Cambodia in pieces 4 to 8 cts each. These have been hand-selected for their fine color, clarity, and potential yield. $ 4.50 / ct.
What Angles Should I Use? There is no universal agreement on what angles to use for the various materials. We have put together a "cheat sheet" you can print directly from your browser which lists some of the more commonly faceted materials and their respective faceting angles published by 3 generally accepted sources. Each set of angles has slightly different optical characteristics, and the definition of which is "best" is purely a matter of personal preference. Glenn & Martha Vargas, "Faceting for Amateurs"
M.D.R. Manufacturing, "The Book of Gem Cuts"
Charles Schlagel, "Gem & Minerals" magazine, March 1966. All colors and measurements are to be considered estimates only; Please inspect your order when you receive it and form your own determinations. Of course, I offer 15-day return privilege on any unaltered materials for refund, credit, or exchange. For information on Facet Shoppe products and services, gemcutting, and especially if you have comments about these pages; please send them to me. Page maintained by John Franke, facet@gemcutter.com. Copyright(c) 1995-2006. Updated: 10-10-06 All Rights Reserved.